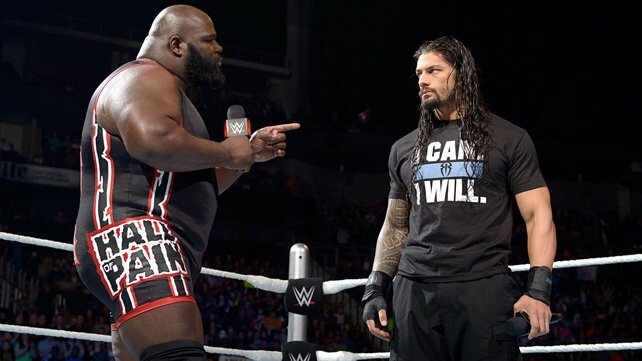 Seth Rollins and Kane were set to face Roman Reigns and Mark Henry in SmackDown’s main event. However, if you know the authority at all, nothing is ever as it seems. Discover what Seth Rollins and Kane had in store for The Big Dog with video and results provided by wwe.com. Roman Reigns was interrupted by The World’s Strongest Man yet again on SmackDown. Only this time, he stated his approval and belief in The Big Dog ahead of his WWE World Heavyweight Championship Match against Brock Lesnar at WrestleMania 31. The Authority quickly intervened and Seth Rollins informed everyone that Randy Orton would not be allowed in the building thanks to J& J Security. Corporate Kane then announced that he and Mr. Money in the Bank would be facing Henry & Reigns in the evening’s main event. AJ Lee and Divas Champion Nikki Bella smack talked SmackDown from the commentary table announce team during the match. Paige would outlast Brie Bella’s hard-hitting attack to take a W via rollup pin. Stardust threw down with The Lunatic Fringe to kick off SmackDown’s Intercontinental Title Contender Gauntlet Match. Dean Ambrose Reversed the former Intercontinental Champion’s sunset-flip attempt to pick up the win. Stardust inflicted a post-match attack on his unstable opponent before R-Truth came out for his match and cut off the crazed competitor. R-Truth would fall victim to Ambrose’s Dirty Deeds after getting distracted by Stardust on the ring apron. Luke Harper jumped into the fray next, showing no remorse toward Dean Ambrose’s injured shoulder. The Lunatic Fringe put up a determined fight, but a clothesline, sit-down powerbomb combination from the former Wyatt Family member finally put an end to the Ambrose’s night. Daniel Bryan was next and cut his creepy opponent down to size by forcing him to tap out to a devastating single leg submission maneuver. The “Yes!” Man would have little time to celebrate, though, as the final Gauntlet Match participant appeared, ready to steal the show. Daniel Bryan and Dolph Ziggler fought relentlessly but in the end, it was The Showoff who would stand tall. Ziggler dodged a kick from Bryan before hitting the Zig-Zag for the win. The two exasperated Superstars shared a handshake after the contest, but Bad News Barrett came down to the ring to deliver Bull Hammer Elbows to both contenders. The first-ever Six-Being Interspecies Tag Team Match had no shortage of high-flying action. With Los Matadores and the WWE Tag Team Champions sprawled out around the ring amid a hectic attack, Natalya took advantage and powerbombed El Torito for the emphatic win. What was supposed to be a tag team match turned into a 2-on-1 Handicap Match after Mark Henry was found laid out backstage before the contest. Roman Reigns remained undeterred, however, overcoming Authority after delivering a Superman Punch to Seth Rollins and Spearing Kane for the victory. Seth Rollins’ rough night quickly got a whole lot worse as Randy Orton slithered into the ring before inflicting a ferocious post-match attack on The Architect. Soon, The Viper was RKO’ing everybody in sight, including Rollins’ security team. Somehow, the self-proclaimed “Future of WWE” escaped SmackDown without suffering the venomous fate of Orton’s RKO finisher. Will Rollins be so lucky at WrestleMania 31? Next articleWWE Raw Preview: Will John Cena Finally Catch Rusev?